These are the goals that most of the clients that I work with indicate as their priorities. Surprisingly, flexibility is the #1 goal among both athletes and post-rehab students that I work with. Modern lifestyle creates many opportunities for our bodies to get tight and tense. Whether it’s the computer posture, long commute hours, rigorous training schedule or daily stress, our bodies need help staying supple and flexible despite these factors. 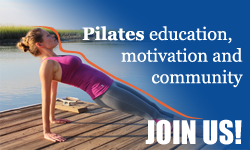 One of the reasons why Pilates becomes an invaluable wellness tool for every BODY is that it creates the optimal balance of strength and stretch so that we can enjoy our life and our activities. While a consistent Pilates practice can be enough to improve flexibility over time I find that most students need a little “boost” to connect to their bodies and release tight spots especially if they are coming in after a long run, long drive or flight. In order to help my students get maximum benefit out of their Pilates session I add a few minutes of Stretch and Release work using massage balls to our session. In fact, Stretch and Release monthly Pilates workshop is the most popular class at the studio where I teach, Lotus Pilates and Bodyworks. This class gets filled up almost immediately month after month and our students really enjoy how open and relaxed they feel afterwards. You can use other types of massage balls as well, experiment with the size and hardness of the balls for the most delicious sensations.